On busy days, it’s often more than a little tempting to get an expensive drive-thru dinner just because the ingredients you have at home will take too long to make into a meal. But I’ve found that if I keep ingredients handy in the pantry and refrigerator for simple meal prep, I can have dinner on the table in a flash – and protect my pocketbook from that ravenous Fast Food Monster at the same time! 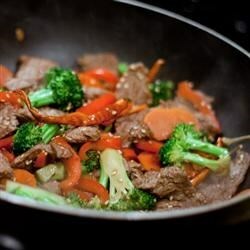 One of my favorite quick fix meal preparation methods is stir-frying. Including the prep time of chopping up meats and veggies, I can usually have a meal on the table from start to finish in about 15-20 minutes. It’s just a simple process where you rapidly cook meat and vegetables in a small amount of oil. The process is similar to sauteing, except you use less oil, hotter temperatures, and usually a wok. I do most of my stir-frying in my large heavy skillet on the stove-top because I don’t have enough storage in my kitchen to keep my wok handy. I’m usually just too lazy on a hectic day to walk to the cupboard down the hall to grab the wok. You can find basic stir-fry instructions in almost any good general cookbook or browse through books at the library on Asian cooking. With a quick search online, you’ll discover that the Internet’s full of great recipes – and all for free! Don’t you just love that price? It warms my little frugal heart. You want the oil in your wok or frying pan hot enough that it’s slightly smoking, otherwise the stir-frying will be too slow and your vegetables will be limp. Cut your ingredients into thin, bite-sized pieces so they’ll cook evenly and quickly. It’s helpful to choose vegetables and meats that will all cook at about the same speed, otherwise you have to keep track of when to add the different ingredients so everything’s cooked, but nothing’s overcooked. Cook the meat first, remove from the pan, and then cook the vegetables. Add the meat back into the pan at the end of cooking. This keeps the flavors distinct and separate, and also keeps the meat from overcooking. If you have ingredients that need to be added at different times in the cooking process, chop them up ahead of time and put them onto separate plates. Then you can just pick up the plate and dump the contents directly into the wok or frying pan as needed. When stir-frying, you want everything chopped and prepped in advance because you can’t stop stir-frying partway through the process to cut up vegetables or slice meat. Once you start cooking, keep stirring and tossing constantly or things will burn or cook unevenly. Fresh vegetables are wonderful in stir-fry meals, so when your summer garden really starts producing, you’re in the middle of stir-fry days. To make stir-frying easy as can be, you’ll want to keep stocked up on some pantry staples. Keep watch for the following items when they go on sale – then you’ll be ready to stir-fry at a moment’s notice: fresh garlic, crushed red pepper, sesame seeds, red chili paste, fresh ginger, water chestnuts, bamboo shoots, chopped peanuts and cashews, Chinese spice blend, sesame oil, peanut oil, soy sauce, Teriyaki sauce, rice vinegar, beef broth, cooking sherry, cornstarch, rice, and Asian noodles.